Madix understands the needs of Internet and mail-order retailers and suppliers. A leading innovator in the store fixture industry, Madix has a history of successfully helping Internet and mail-order retailers solve their backroom challenges. Internet and mail order companies must stay organized to quickly fulfill their orders. For optimal storage, utilize heavy-duty racking to efficiently warehouse and store products, bulk items, and shipping material. Madix's Heavy-Duty Systems, including Omega, Wide Span, and Pallet Rack, make it easy to fulfill Internet orders and mail order requests. An efficient storage area also helps keep up with hand-stacked inventory. When we look at the changes in your company over the past three years, we are impressed. This, coupled with the fact that Madix is growing in a tough market when everyone else is shrinking, is amazing. Fast order fulfillment is the driving force for Internet and mail order retailers and suppliers. 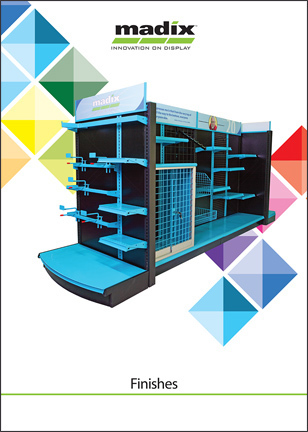 Increase productivity by utilizing Madix's Omega Merchandising System that offers a range of shelving and merchandising options. Omega is an optimal choice for bulk merchandising and small product storage. Madix provides an entire line of heavy-duty products that will help maximize backroom organization for faster product picking. Pallet Rack is the ultimate solution for heavy-duty racking. Attractive sales-floor bulk merchandiser or as an efficient warehouse storage rack. Times are changing and the warehouse footprint is shrinking. Storage areas are downsizing and square footage has become precious space. Madix counters this issue with the innovative Catwalk system. Meant for light-duty products, the Catwalk system makes fulfillment more efficient by optimizing vertical height storage. Catwalk creates a multi-level storage system custom fit for individual backroom needs. Contact your Madix sales consultant for more information on Catwalk. The space-utilizing Catwalk System is designed to eliminate storage issues often plagued by downsized backrooms. Many storage problems are solved by use of sturdy, economical Madix Storage Shelving. Hardy enough for the back room, attractive enough for the aisles, dependable enough for both.